This database is registered with approximately 480 components and approximately 2,680 transitions, and eliminates the need to configure complicated analysis conditions. Furthermore, retention indices are registered for all the components, enabling easy updating of retention times via the AART (Automatic Adjustment of Retention Time) function. Analysis by the internal standard method is also supported, since information is registered for compounds that can be used as internal standard substances. 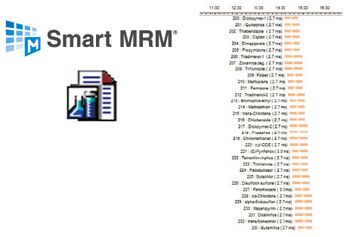 The Smart MRM program creates MRM methods automatically. In multicomponent batch analysis, it is difficult to configure the measurement program settings. Smart MRM, however, allows the system to set the optimal program and create a high-sensitivity method. The MRM method is created based on the retention time information for the target compounds. By utilizing the AART function, you can correct the retention times and proceed with method creation from just a single n-alkane analysis. The database can be used to perform analysis not only under the conditions specified in the database, but also under different column and GC conditions by simply editing the retention indices. 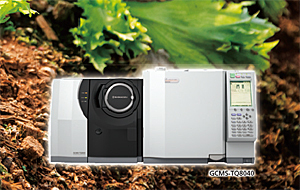 In addition, new compounds can be added by using the GCMSsolution MRM Optimization Tool. 1. Perform an n-alkane analysis. 2. Update the retention times using AART. 3. Use Smart MRM to create the MRM method automatically.